I won't go into how come I wanted to get this (convertible and a 4x4), and to make a long story short, I got a tip from a friend about this truck. 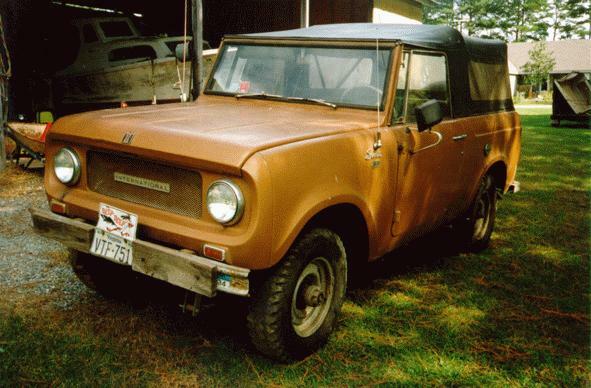 A mutual friend used to drive it to school, then his dad took it back when he got a Scout II. A little more into the life of this one, and a freeze plug rusted enough to let water out one time. His dad put off restoring the thing so he put it in his garage. Ten years later, I start inquiring about it and he agrees to sell it to me for a price of $450, so I jumped at it. The seller mentioned needing the freeze plugs, shocks all around, tires, brake work, and possibly a steering rebuild, but it came with a soft top that saw only two years of service before seeing the garage, a very clean hard top, new carb/fuel pump, very little rust, and a perfectly clean interior. 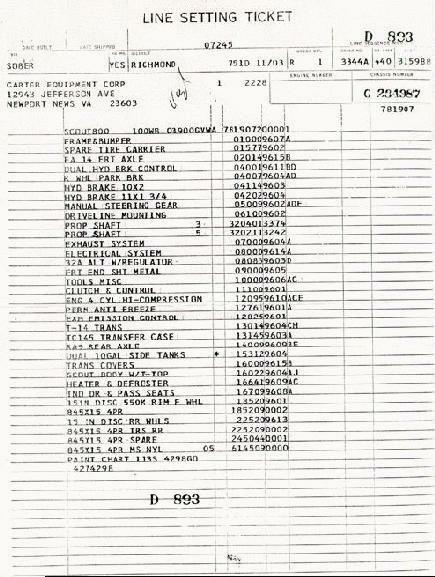 The owner purchased it on September 19, 1968 and the original bill of sale was still in the glove box with the owner's manual and original line-setting ticket! When my dad and I went to pick it up on a flatbed trailer, we hooked the winch to the ball hitch on the bumper and started reeling it in until we realized the rear wheels weren't moving. It was out of gear, no parking brake set, we even took the driveshaft off but no luck. After getting it on a jack, we managed to get the wheels to turn opposite ways, but the pinion wasn't moving an inch. We made a runway out of lumber for the floor jack and lubed the ramps so we could slide it up to where we could jack the rear end up when it got to the trailer. Finally, we got it on and secured and we were off to my dad's shop to begin it's restoration. This is the first used vehicle I've ever bought that needed work, so this will be quite a learning experience for me. Fortunately, my dad is incredibly adept at this sort of thing (he used to build and drive hot-rods and AA Fuel dragsters), so I'll have plenty of proper guidance about how the best way to go about it might be.